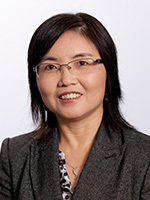 After serving as a Research Assistant in the Department of Statistics and Actuarial Science at the University of Waterloo, Dr. Xu received her academic appointment in 2003 as an Assistant Professor in the Center of American Indian Health Research of the College of Public Health at the University of Oklahoma Health Sciences Center in Oklahoma City, Oklahoma. She joined Houston Methodist Research Institute in 2007. Dr. Xu’s biostatistics work has primarily focused on diabetes, heart disease, and kidney disease in medically underserved populations. She was the biostatistician for the NIH-funded Strong Heart Study, the largest and longest longitudinal study of cardiovascular disease and its risk factors in American Indians. Dr. Xu’s current biostatistics studies include industry-funded chemotherapy trials for her2neu negative breast cancer patients. Is regadenoson an appropriate stressor for MPI in patients with left bundle branch block or pacemakers? Does quantifying epicardial and intrathoracic fat with noncontrast computed tomography improve risk stratification beyond calcium scoring alone?